Kara no Kyoukai (lit. The Boundary of Emptiness), is a series that has taken a long time to become well known. The story was originally created in 1998 by Nasu Kinoko and Takeuchi Takashi (who later went on to form TYPE-MOON), with the first five chapters being released on their doujin website, whilst the final two chapters were released in August 1999 at Comiket 56. The series was picked up by Kodansha for commercial publication in 2004, and this year (2009), will see the series released on the international market courtesy of Del Rey Manga. Now fans of Shingetsutan Tsukihime will be find many things in Kara no Kyoukai familiar, not the least of which is the fact that they are both created by TYPE-MOON. The stories have several parallels within them, which has led to the latter series being considered an alternate version of the former, or at the very least, set in the same world. The anime adaptation of the series is being released as seven movies that run for approxiamtely 50 minutes each. Each individual film features a different time period, with no two consecutive movies following in any kind of chronological order. Unlike Suzumiya Haruhi no Yuutsu though, this seemingly out-of-sequence airing is not simply because of a whim on the part of the producers. The non-consecutive ordering is how the series is should be portrayed, and the anime has stayed faithful to that method. The first movie, entitled Overlooking View, is surprisingly good in terms of its story. Although there is very little character development, the story moves along at a nice pace, and the tense nature of the movie is very much apparent to the viewer. The movie is somewhat predictable in places though, however this doesn't really detract from one's enjoyment of it as an individual episode. One thing to note is that the series subtitle, &quot;The Garden of Sinners&quot;, is actually very appropriate. The first movie does a good job of highlighting the fact that the world in which the story takes place is no heaven by any measure, and that not everything is as simple as people may at first believe. The art and animation for the series is done by Ufotable, a company for which I have a distinct soft spot. Like many Ufotable productions the animation style is distinctive in certain ways, especially during the action sequences (fans of Futakoi Alternative will know what I'm talking about here), and fans will notice Ufotable's trademark claymation sequences at the beginning of each movie (in other series they are shown with the credits at the end of each episode). The animation is generally very well done, and what may seem like blips in the animating sequence are often purposeful, part of this distinctive style I mentioned. The backgrounds and backdrops are generally excellent. The maze-like structure of the Fujo building is very well depicted, as are the various outdoor scenes and indoor scenes. The CG has been almost seamlessly incorporated into the show, and the smoothness of the CG adds to the effect of the action sequences. Character designs are taken directly from the original designs for the novels by Takeuchi Takashi, however fans of Tsukihime will also notice similarities in the features of several of the characters. One area where the movie manages to stamp it's mark is with the sound effects. These are often very clear and well used, fading to background noise when necessary.The effects used during the action sequences are sometimes sharp in comparison to the rest of the movie, whilst the effects used to promote an atmosphere of tension are a little lacking. The music sometimes lacks a little subtlety, but generally serves to heighten the effect of a particular scene, addinga sense of foreboding in some sequences. The voice actors are well used, with the three main characters being decently portrayed. Sakamoto Maaya, who plays the role of Ryougi Shiki, brings a certain edge, a certain chill, to her voice at the times when it's necessary, something which adds to the overall effect of the character. Unfortunately, the rest of the cast don't really have much scope to display their skill. Hopefully the following movies will rectify this though. I will freely admit that the rating I have given the characters is not fair, but this is because a valid assessment of each character is extremely difficult in this case. The fact that the movie is only 50 minutes long means that there is no real development to each character, but I am withholding a final opinion until the end of the series. As I mentioned before there are certain parallels with Shingetsutan Tsukihime, and nowhere is this more apparent than with the characters. Ryougi Shiki doesn't just share her name with Tohno Shiki of Tsukihime, she also has the &quot;Mystic Eyes of Death Perception&quot; (and she looks a bit like Ciel). Likewise, Aozaki Touko shares her name with Aozaki Aoko, and both help the person named Shiki in their respective shows (they also seem to know more than they let on as well). In general the characters are well done, but they lack a certain depth which will hopefully be rectified as the series continues. Overall this is a very enjoyable movie. The pacing of the story, the tension of various scenes, and the semi-combative relationship of the characters, all serve to raise this above the often substandard fare around. The fact that the series is being done as individual movies is also a plus, as each story arc is completed within a nice timeframe. The movie may be a little predictable, but as a first offering it was very impressive nonetheless. Some people may not enjoy the first movie for a number of reasons (it has no real romance, no character development, no sequential plot, etc), but personally, I'm looking forward to the rest of the series. 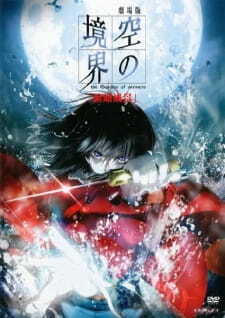 Kara No Kyoukai 1: Fukan Fuukei is the first of seven movies based on a series of light novels written by Kinoko Nasu and illustrated by Takashi Takeuchi. Despite the first in a septenary - for better or worse - the movie takes a rather disjointed, obscure approach. You may expect the first in a septenary to chronicle the inception of the cast, or to establish the universe and conflict in the series. Instead, audiences are thrown into the middle of a story which seems like it was written for people with previous knowledge of the Kara no Kyoukai franchise. There's little in the way of introductions, which musters very little connection to or understanding of the characters. The film is shrouded in mystery, but produces very little intrigue - the foundations seem absent; it sets up a plot but struggles (or rather, doesn't attempt) to develop any of the characters. It's an okay technique to pull in the audience during the first act - get them pondering and interested through obscurity - but it doesn't work well when that's all you're doing throughout the entire film. This causes the story to fall flat and come across as lackluster with very little substance; just another plot involving baddies and a team adept at dealing with them. It's this extreme lack of depth to the characters that really spoils what could be an exciting film. With no connection to the cast comes a struggle to care about them and, by extension, the story. There are three members of the main cast, with a very weak supporting team, and hints of depth are just that - hints. The writers want it to be interesting by being cryptic, but they completely miss the mark. The animation and art style are saving graces, if the film isn't already too far gone. The character designs, backgrounds and general views are all very crisp and detailed. The art department communicate well a very dark and isolated tone. The animation is fluid and the action sequences are stunning. The music, too, is very well implemented. The backing tracks blend fittingly with the dark tone and the more uptempo pieces used during the action sequences complement them significantly. However, due to such uninspired characters which pave the way for a very bland story, the film comes across as fearfully mediocre. Some depth to the characters would have gone leaps and bounds, but the writers' refusal engage with them in the first installment doesn't make for a very compelling film. The only thing I enjoyed in this movie was the art. And even in that department it has flaws (the characters are way too traditionally drawn). The story is, actually, non-existent, and we get to see only a glimpse of character development. There's a wide range of quasi-philosophical mumbo-jumbo which seems absolutely random and pointless. This movie did nothing for me. I've seen more happening in first five minutes of a series that has 110 episodes, than I've seen in 50 minutes of Kara no Kyoukai: Fukan Fuukei. The sound has it's good moments. But there's so much silence, trying to unsuccsessfully create an 'atmosphere' that the movie, in my opinion, fails in this department too. The good parts (art, sparse fight scenes) are slaughtered by Aozaki Touko's lamentations, as well with trying to force a dark, desperate atmosphere onto the beautifully drawn world. I guess it was supposed to be smart and intellectually enticing, posing questions about suicide, courage to withstand life, and whatnot. However it may try, the movie fails. The characters seem as rough drafts, with too many typical traits, the stoyline of a 50 minute movie should have actually existed. Now, I do not know the background of the story. I have not read the novels, I just wanted to watch a movie for a change. I think Kara no Kyoukai should have been categorized as a series. Because Fuukan Fuukei cannot call itself a movie, even if it goes on for 50 minutes. I will watch the other 6 movies because I hate making decisive opinions about something I haven't gotten to familiarize myself with completely. However, I think it is reasonable to form an opinion after watching something that calls itself a movie. Before i start the review, i would like to give a short disclaimer/warning to this anime, if you do not want to read it, that is fine, please skip to my actual review. Okay, so Kara no Kyoukai is a series of 7 films and 1 OVA epilogue to them, please do not assume that each movie has its own beginning and end like normal movies do, i would rather consider this as extended episodes rather than movies as much like Harry Potter, each one ends on a cliffhanger to tell the one same story and while yes each movie does have its own plot, it takes all 7 movies to explain things you may have seen in the first, thankyou for reading! Fukan Fuukei is the first of 7 anime movies produced by studio Ufotable (well known for Fate/Zero) and is the introduction to possibly one of my favourite anime of all time. While this film is rather slow in comparison to the later films, Fukan Fuukei (Overlooking View) has a lot to like in terms of pacing, we follow Ryogi Shiki, a woman who has the ability of Death Perception as she works for Touko Aozaki to investigate paranormal events and take them by force if necessary. This film in particular is heavily story driven, with only two action scenes in the entire 48 minute movie, Overlooking View focuses squarely on Mikiya, Shiki and Touko's relationship with eachother and the story should be considered a prologue to the overarching story. The budget Ufotable has for their shows can seemingly buy Japan itself as this film's art and animation is possibly one of if not the most beautiful thing ive ever had the pleasure of watching in the anime medium, the vibrant colours inside Shiki's eyes (when in battle) contrast to the overall dark and gloomy background gloriously and the divine backgrounds this show has to offer are equally a treat for the eye. Every penny they spent on the animation was superb and then some with only Fate/Zero and Gankutsuou being possible contenders for best looking anime i have ever seen, this is seriously not something that should be missed. I gave this a 9 as, even though all of the music in the movie is the same song composed in different ways, tempos and using many different instruments from a choir accompanied with an acoustic guitar to the completely badass 'Fighting Medley' which is the same song with a full blown orchestra in the more intense parts this film has to offer, and because of how perfectly it blends in with Shiki ripping off her jacket to fight, it has found its way onto my list of all time greatest anime OSTs, plus, you know, an anime with songs composed by Yuki Kajiura? C'mon of course the soundtrack is awesome! As i previously stated this film is heavy on character development to give you the basic premise of who they are and nothing more, the film can only give you the amount of character development you get in a regular 2 1/2 anime episodes and aside from Code Geass and Persona 4, that isnt enough time to solidly develop any character, especially one's with so much back story that this film has prepped you for, but not explained. I try to be fair with my reviews but when it comes to an anime i put on a pedastal as possibly the greatest anime i have ever watched, its difficult to say i dont thoroughly enjoy watching all of these movies, this film is quite slow, granted, but the Yuki Kajiura OST, beautifully executed fight scenes, perfectly paced character development to set you up for the next film and absolutely GORGEOUS visuals, how can anyone say they didn't find something to like from this? Its also difficult to only review the first film which is the equivalent of only reviewing 2 episodes to your favourite anime, i cant explain whatll happen next nor can i explain what this film holds because in comparison to the entire set of movies, this doesnt contain as much as some of them, so i'll let you enjoy it when you go watch it, which i whole-heartedly recommend you do as this is not one to miss and its a real shame not as many people are aware of this truly stunning series.